Most people will laugh at how we’re still here talking about VCRs and DVD players while the world has moved on to digitally downloading movies and sometimes even pirating them. But back in the day, a good DVD player meant a great time at home, lesser expenses, and a larger circle of friends huddled around in the night to scream at every jump scare. Even now, as the world continues to evolve, a bit of nostalgia keeps DVD players alive, and they have multiple uses now that people have started getting closer to each other. For instance, a DVD player can be used to watch horror and fantasy films just like in the old days. It can even be a much more legal option than pirating. Portable DVD players are the new trend nowadays, and they can be used when you’re out traveling and want to review your videos and photos. The player is extremely helpful in these cases, especially if all your videos are in a DVD format. And we know just how much you guys love cheap and effective products. Which is why we have gathered our top 3 picks so that you can buy the best DVD players of 2018. The DBPower is full of power and fun. This one is our personal favorite because it is so compact yet so efficient. It has a dozen features, a widescreen, amazing image rendering quality, and will fit inside your bag just perfectly. The DBPower is a very small device, about 24 cm long and 18 cm wide. 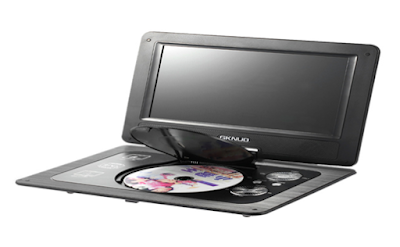 The display size is 9.5 inches, making this the most compact DVD player with the largest screen. The DBPower DVD player can read DVD-Rs, CD-Rs, CD-RWs, DVD-RW, VCDs, and SVCDs, along with support for SD cards and MP3, WMA, JPEG, MPEG, and much more. This player can be used by the kids as a gaming station and can read video game CDs just like a PC or a laptop. It also has joystick controls to imitate the full gaming experience. Can support a number of images, video, and game formats. Can be used for gaming; fully equipped with joystick and controls. The 9.5-inch widescreen which can rotate as much as 270 degrees. Cannot be directly attached to the seat’s headrest. This product has a large widescreen which measures approximately 14 inches. This is quite big and is backed up by the swivel feature, which allows the screen to rotate as much as 180 degrees. Apart from regular CD-R and DVD-R readers, the Synagy also has USB slots that allow USBs of any size to be used. It also features an audio jack for headphones. The Synagy has a remote control that makes it easier to flip through the videos while laying back in the car. The screen is 14 inches wide and can swivel smoothly in all angles. Can read CD-R, DVD-R, WMA, WAV, AMI, as well as USBs and SD cards. Cannot play Blu-Ray and other modern formats. The ieGeek is a portable DVD player with a wide screen of 9.5 inches which provides great image rendering and video quality. The ieGeek DVD Player has been integrated with eye protection technology to provide ease and comfort in children, and to remove the eye strain that comes from looking at a screen for too long. The 9.5-inch screen is great for image rendering, although the size may not be as big as competitive DVD players. But the swivel feature is what makes it one of the best. The ieGeek DVD Player is a great choice for kids as it offers eye protection and easy handling for children. Can read DVDs and CDs as well as USBs and SD cards. 9.5-inch display with a swivel feature. Designed for both adults and kids. We’ve reviewed three DVD players, and we loved every single one of them. The DBPower was just as good a choice as the Synagy, all of which were pretty competitive with the ieGeek. So now that you know our top picks, it’s time to go out and buy the best DVD player for 2018! Message: I hope that you have enjoyed 'The Top 3 DVD Players That You Must Buy in 2018' article on Tips2secure. However, if you want me to deliver more items, then please share my post. You can use Social Sharing Widget provided at the end of every post. After all, Sharing is Caring!